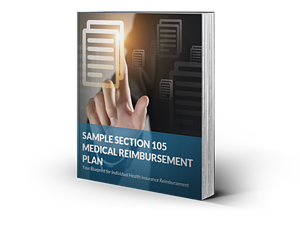 Zane Benefits, the leader in individual health insurance reimbursement for small businesses, announced today the publication of a new resource, "Sample Section 105 Medical Reimbursement Plan." The guide helps small businesses understand and set up an individual health insurance reimbursement program. According to Zane Benefits, a significant milestone for small and growing businesses is offering employee health benefits. For most small businesses, however, traditional employer health insurance is out of reach. The cost is too high or the company cannot meet eligibility requirements. As a result, small businesses are approaching employee health benefits a little differently. Instead of contributing to employer health insurance coverage businesses are setting up Section 105 Medical Reimbursement Plans to reimburse employees for individual health insurance coverage. Individual health insurance reimbursement is being widely adopted because small employers need affordable, financially sustainable healthcare options. Individual health insurance offers employees permanent, quality health insurance and Section 105 Plans offer employers a way to contribute to employees' healthcare expenses. Additionally, in light of this week's Supreme Court ruling on the ObamaCare tax credits, it is anticipated the shift to individual health insurance will increase significantly in the years to come. The new guide provides small business owners and leadership teams with practical tools, information, and worksheets to understand how to use Section 105 Plans for individual health insurance reimbursement.